Let’s hear it once again for Mexican food! We visited one of our favorite Mexican restaurants just last week and by Monday I was already in the mood for an at home Fiesta! 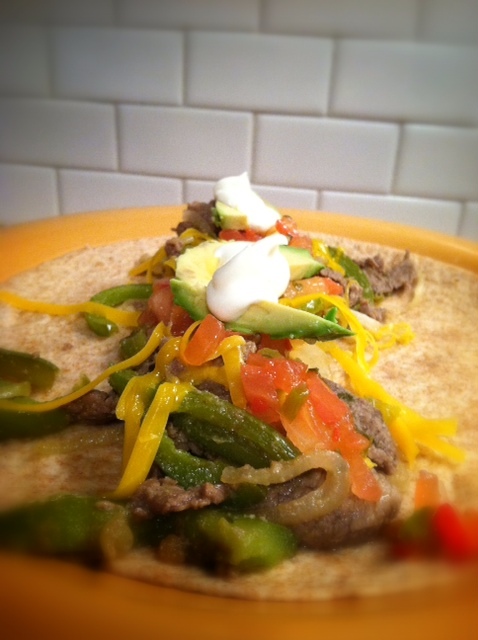 So I curved my craving with Steak Fajitas! 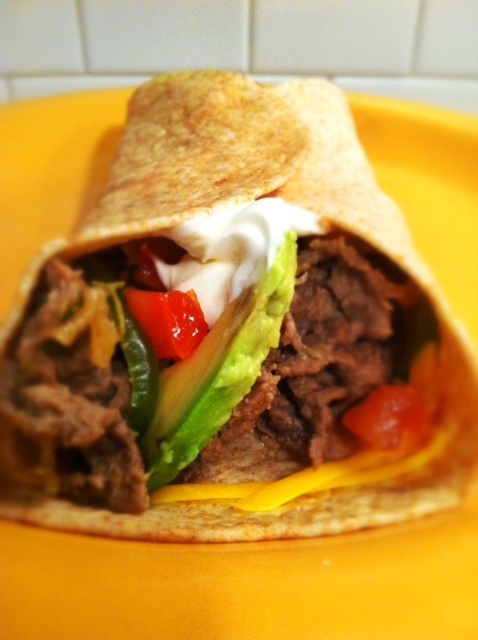 I have been making these delicious carne asada filled tortillas since long ago, when I got the recipe, from a really sweet lady. This marinade is so much less salty and more flavorful than the powder in the packet and you probably already have most of the ingredients at home. I know you hear marinade and think “time” . No worries, it only needs to sit for 30 minutes! While that’s setting up you have time to get everything else ready. The secret ingredient is orange juice. Weird right? I mean, lime you might expect but orange? Whatever works. I use yellow onion and green bell pepper but you could use different colored bells and mushrooms too if your taste buds like those. I prefer only to dress them up with sour cream and cheese but you could certainly add your favorite toppings too. That’s ANOTHER great thing about Mexican food: rice, beans, sour cream, cheese, lettuce, tomato, pico, guacamole, avacado-this list goes on and on. There are so many ways to change it up! Goals people. We all have them. In a container with a secure top or a large ziploc bag, combine organge juice, vinegar, garlic, seasoning salt, oregano, cumin powder and cayenne. Stir or shake to coat. Leave in fridge for 30 minutes or overnight. 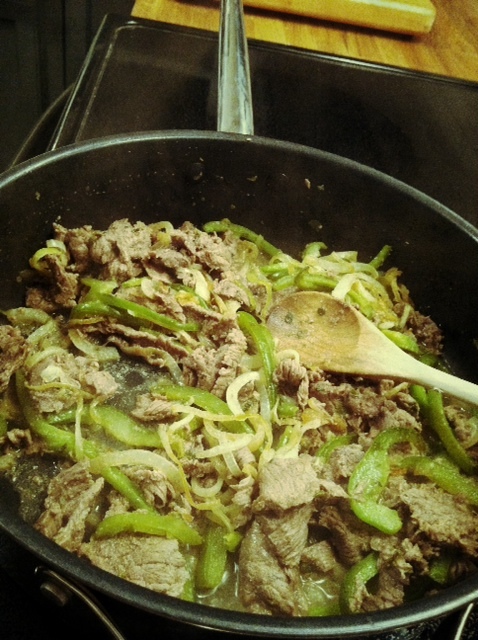 In a large skillet heat oil over medium heat and add onion and bell pepper until they have softened to desired tenderness. I cooked mine for 20 minutes. 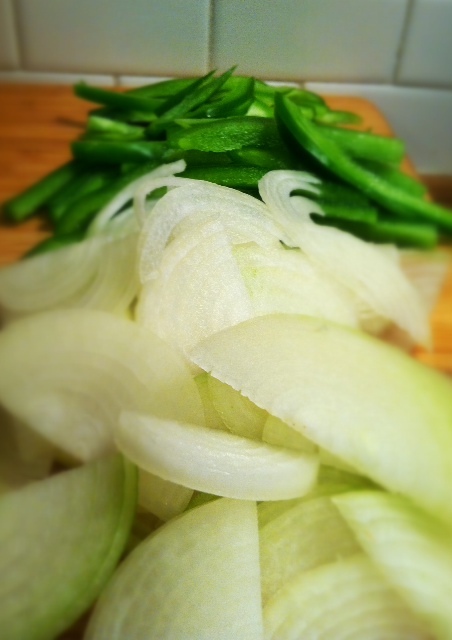 Remove from pan and set aside in a bowl. 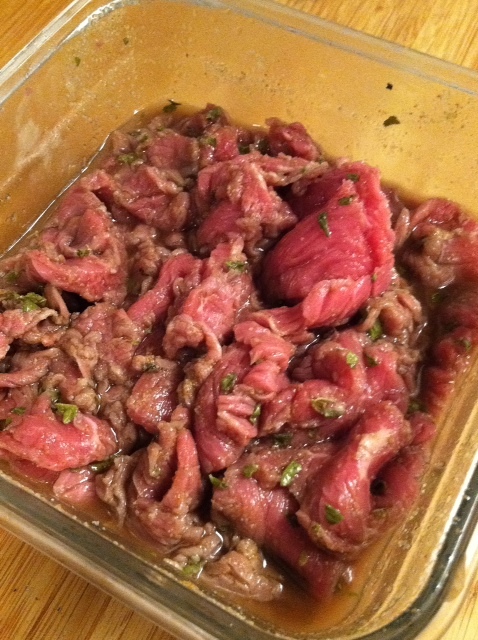 Drain meat and discard marinade. In the same skillet that you cooked the onion, cook the steak for 5-6 minutes or until steak is no longer pink. Return vegetables to the pan and heat through. 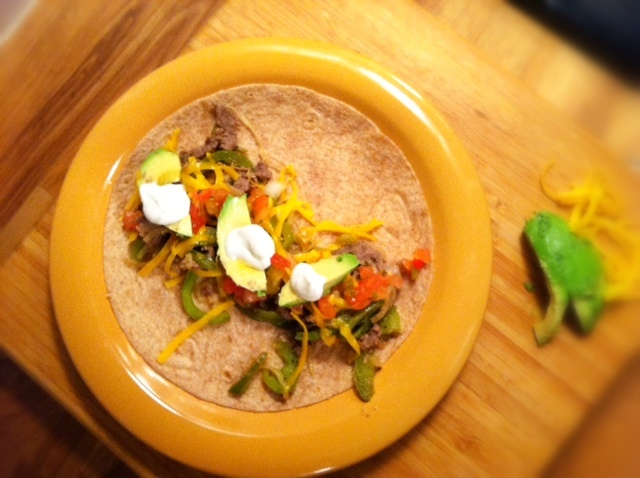 Spoon steak and vegetables onto warmed tortilla shells and top with sour cream and cheese. Garnish with pico de gallo and avocado if desired.